Are you considering buying an Instant Pot but not sure if you need another appliance and if pressure cooking is for you? Here are 7 Things You Need To Know About Instant Pot and why you might even not want to buy it. Also a few points on why I love my Instant Pot. This post contains amazon affiliate links which means that you if you buy something after following one of the amazon links in this post, I will receive a small commission. I am part of about 300 hundred Instant Pot Facebook group (ok, I’m exaggerating a little bit) and I see posts a few times a day asking about how to use Instant Pot or talking about the actual time of cooking in an electric pressure cooker or complaining about the steam that they didn’t expect. I was the same. I expected a miracle product and at first was disappointed by what I got. It took time for me to like my Instant Pot and even more time to love using it. I hope this article will help people considering buying an Instant Pot. Here you will find 7 Things You Need To Know About Instant Pot and why you might even not want to buy it. One of the most common questions I see in the Instant Pot communities is: “What brand of Instant Pot should I buy?” This question actually does not make sense because Instant Pot is a name of a brand. What people actually mean is: “What brand of an electric pressure cooker should I buy?” However, Instant Pot brand is now one of the most popular on the market (at least in North America) so it became almost synonymous to saying electric pressure cooker. Now, is Instant Pot instant? No! BIG NO! But naming the brand “Not too quick but faster than average cooking pot” wouldn’t be a good marketing decision so it’s called Instant Pot. In order for an electric pressure cooker to pressure cook something it needs to come to pressure first. Building pressure means that you must have liquid in the pot (no crunchy and crispy food here), then this liquid gets heated up to create lots of steam and pressure. I am actually not well-versed in the mechanics or physics of it but here’s some information on How Electric Pressure Cookers Work. This is the part that could take anywhere from 4 minutes to 40 minutes. Yes, you’ve read it right! Put a big piece of cold meat from the fridge, add a liter or more of cold liquid, some vegetables, and the time to the pressure cooker to even start cooking could take up to 40 minutes! This is something that MANY recipes try to not discuss or mention only in passing. It obviously sounds a lot better when you say that “Mac and cheese will be cooked in 4 minutes” instead of “Mac and cheese will be cooked in 30 minutes.” In my recipes I ALWAYS talk openly about the actual time it takes to cook something in my Instant Pot. So, to recap, the more liquid you have, the longer it will take to build pressure. The more food in your Instant Pot you have, the longer it will take to build pressure. The colder the ingredients are, the longer it will take to build pressure. Note: different models take different time to build pressure. My model takes longer than some of my friends’ as it turned out. So, you thought once the food is done, it’s done and you can eat right away. Right? Wrong! Because of the way electric pressure cookers work, the inside of the pot is under a lot of pressure which means that you can’t simply open the lid when the food is done. You have to release the pressure (steam) from the pot safely first and then you can open the lid. There are a few ways of releasing pressure: quick release and natural release. Quick release means that you manually move a valve on the lid and release the pressure this way. Natural release means that you wait until the pressure releases well, naturally. Depending on the amount of food and liquid in the pot, quick release could take between 5-8 minutes, although from all my experimentations it’s about 5 minutes on average. Natural release could be up to 30-40 minutes, it also depends on the amount of food in the pot. And with this, we are back to many recipes that do not account for the time it takes to release the pressure. For example, soup that takes 5 minutes to cook, may also take 20 minutes to come to pressure and then 5 minutes to release the pressure. A lot of recipes are finished with the instructions to allow for a natural release which could add up to 30-40 minutes extra. In my recipes I ALWAYS mention how long it takes to fully cook something in an Instant Pot from start to finish. Note: I was terrified of releasing the pressure or accidentally opening the lid with the pressure still built. Until one day I released the pressure from my rice and then closed the lid and it somehow re-pressurized on its own again. I didn’t notice that and kept trying to open the lid without any luck. So, from my experience, the lid can’t be opened if it’s pressurized (but just in case, don’t try it at home). After months of using my Instant Pot I still find it annoying: Steam!! When the pressure is being released using a Quick Release method, you get a lot of very strong steam coming out of the Instant Pot. I mean, it looks like a steam train. Really! My toddler is always amused by it. At first I kept my Instant Pot on the counter next to the stove in hopes that the vent would work but all the steam kept getting onto the wall cabinets and they started to get dirty. Now I keep it on my island in the middle of the kitchen. I know many people don’t have islands and that means that all the steam (sometimes with spices and droplets of oil etc) will be releasing right onto your wall cabinets. It’s something to think about especially if you have a nice kitchen that you don’t want to ruin. I don’t think I’d be using my Instant Pot as often as I do now if I didn’t have an island in my kitchen. Note: I do not ever keep my Instant Pot under the vent on the stove because I don’t want to accidentally turn the burner on and ruin the appliance. Please don’t do it either. If you talk to Instant Pot enthusiasts then the first thing they tell you is how fast cooking food in Instant Pot is. Well, we just discussed that very often they don’t take into account the time to build the pressure and release the pressure. And although releasing pressure time depends on the amount of food and liquid only, building pressure depends on the temperature of the ingredients. Having room temperature liquid (broth for example) and room temperature meat would mean that everything will come to pressure faster than if the ingredients were cold. If you are rushing home from work then most likely you won’t have time to spend two hours getting everything to room temperature and this is another of my pet peeves with using this appliance. So, if you know you’ll be making a big pot of stew on the weekend, then get your ingredients out ahead of time and fill a jug with water or broth an hour or two before you start cooking. Do you know quantum mechanics? Do you actually love cooking? Tasting the sauce, adding a little bit of this and that? Adjusting the spices? Seeing the magical transformation of ingredients? Well, cooking using a pressure cooker method is totally different! I don’t know if you need a degree in quantum mechanics or physics but figuring out how long to cook something in your Instant Pot is not easy! Deciding what spices to use and if the recipe needs more of something else is only done at the end of the cooking process. You can’t simply open the lid and check if something is done or not. Remember the pressure? There are some recipes that require opening the pot and adding potatoes or pasta and then cooking for another few minutes. 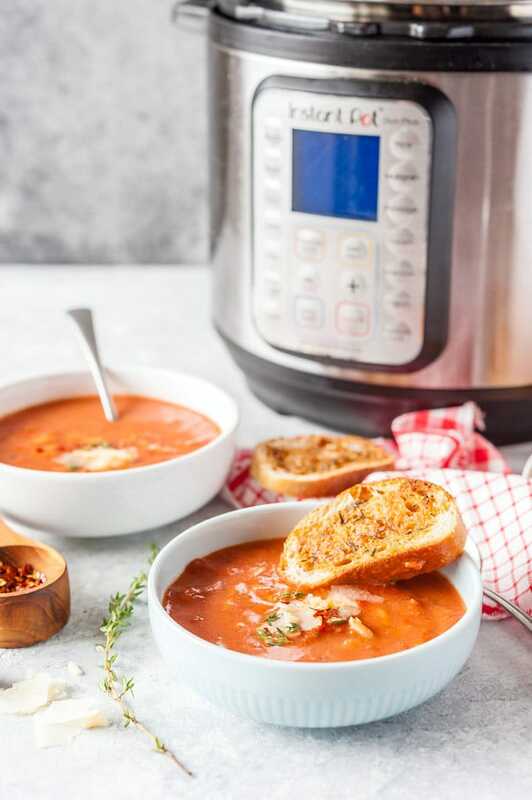 And if this sounds easy with a conventional way of cooking, using an Instant Pot to do that means that extra 10 minutes of cooking actually could mean extra 20-25 minutes. Remember that to open the lid you need to release the pressure (let’s say 5 minutes), then the pot needs to come to pressure again (let’s say another 5 minutes but most likely more), and then once everything is cooked, you need to release the pressure one more time. So, 10 min+5+5+5 is 25 minutes. One time I wanted to add potatoes to my stew in the end and it took almost an extra hour to cook them. I released the pressure, which took about 8 minutes since there was a lot of liquid, added the potatoes and turned it back on to cook for 10 minutes. I read somewhere that 10 minutes for chopped potatoes should be enough. Well, it wasn’t. So, building the pressure, cooking, releasing the pressure, testing, building the pressure again, cooking, releasing the pressure, testing, rinse and repeat. Almost an extra hour! Do you like crispy skin or a nice charred flavour and crust on top of your roast? Well, you won’t get it with an electric pressure cooker. You can sauté something in the Instant Pot first but it’ll be braised or steamed for the next step. You could use your oven to broil the food after but it often defeats the purpose of using one pot and one appliance if you still have to use another pan and an oven to finish cooking something. A lot of recipes come out tasting similar: stews, braises, soups. I don’t mind that as I actually like that kind of food but for some people who are really into cooking and big, bold flavours, it could be a deterrent. And I can’t talk about flavour and texture without talking about Chicken! Many people rave about Instant Pot chicken, especially chicken breasts! Well, I tried. I really tried to like IP chicken but I can’t. The texture of the chicken breast is so weird that neither I nor my toddler could eat it. I’ve seen recipes where people promise that chicken breasts will be cooked in 3 minutes (they often conveniently forget to add the time for the pot to come to pressure and release the pressure) but mine were still raw after that time. If you want to cook chicken in your Instant Pot then you must read this absolutely amazing article from Green Healthy Cooking where Lorena gives your precise temperatures and times! I debated whether I should include this point. 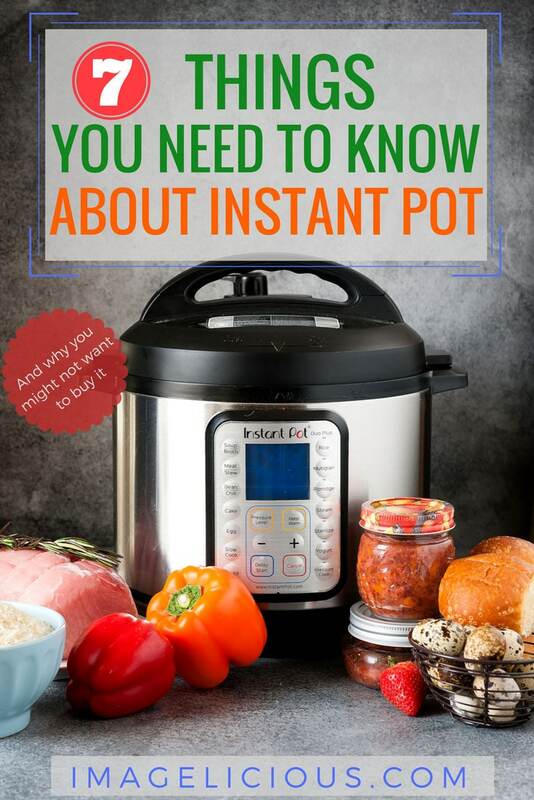 I mean, the article is called 7 Things You Need To Know About Instant Pot, not 8. But I decided it was something that needed to be addressed. A lot of people expect magical results when they start using their Instant Pot. They expect some life-altering appliance that will help them get dinner on the table 30 minutes after they get home. The reason for those expectations is the unrealistic recipes and videos that are all over Facebook and Pinterest. Food blogging is a business. Food bloggers rely on some tactics to get people to visit their blogs. And quick recipes (or even sensationalism as it relates to recipes) is one of the best ways to drive traffic to a food site. Just two days ago I saw a recipe for Instant Pot Beef Stroganoff, the recipe boldly stated that it will be done in 6 minutes. Yes, that’s right, just 6 minutes. It said 2 minutes prep time and 4 minutes cook time. The prep time of 2 minutes included dicing of the onion, cutting of the beef, lightly sautéing, and measuring and adding the rest of the ingredients. I consider myself a very adequate cook (I mean, I do have a cookbook coming out soon so that must count for something) but even I can’t do all of that in 2 minutes. In fact, I just recently made a shortcut version of a beef stew and with the beef already cubed, it took about 5 minutes to prep. That recipe for that beef stroganoff also conveniently forgot to add the time it would take to come to pressure and to release the pressure. I also have my doubts about cooking beef in 4 minutes but that’s a different question. My guess is that in reality the total cooking time of that recipe would be about 30-35 minutes. So, use common sense when looking at the recipes as most of them currently do not tell you the actual cooking time with electric pressure cooker. Also, I have a sneaking suspicion that some recipes are actually fake. Yep, fake news even in the food blogging world! If you see something that comes out brown and crispy and the instructions do not include using the oven to finish up cooking then you know it can’t be right. I mean, you are essentially steaming food under high pressure. As an example, I’ve seen a few recipes for Monkey Breads that look perfectly brown and baked. Some recipes don’t even ask you to cover a pan with foil to prevent the steam from dripping onto the dough. The resulting pictures are gorgeous. I tried making monkey bread in my instant pot and the result was a steamed and barely risen mess. So, again, beware! Now, does it sound like I hate Instant Pot? I actually don’t. It took me months to go from I kinda like it to like it to really like it! I am a convert and I use my Instant Pot a few times a week. I just wanted to talk about the things that no-one usually discusses and 7 Things You Need To Know About Instant Pot that really bothered me when I just started using my IP. 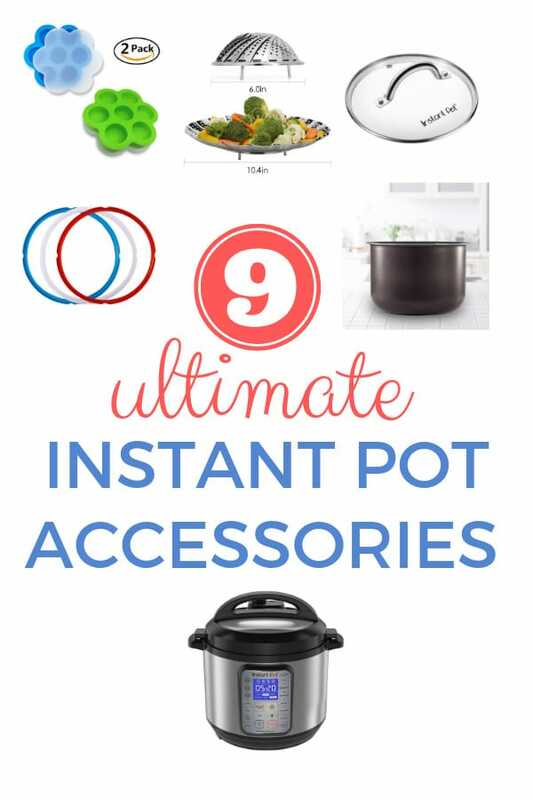 And if you have and love your Instant Pot then you really need to get one or all 9 Ultimate Instant Pot Accessories! They will make your life easier and more enjoyable! If you can only choose one then I highly recommend Instant Pot Ceramic Insert. It’s my favourite accessory of all time! 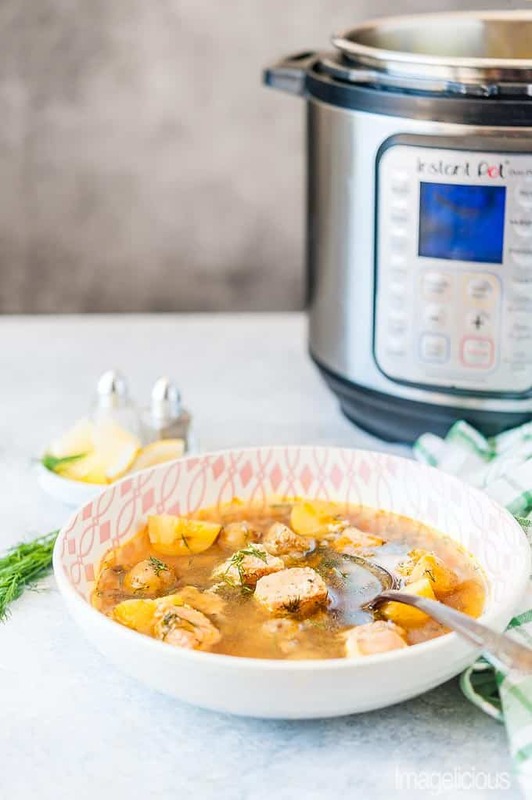 Do you already have an Instant Pot and now you want Instant Pot Recipes? So, what are some things that I like about my Instant Pot? I feel like I have to start this list with humble eggs. Eggs “boiled” in Instant Pot are some of the easiest to peel. Here’s one of the ways to make Hard-Boiled Eggs in Instant Pot. Also, I think that this totally deserves a sub-point. If you like quail eggs (is it a Russian thing? I always have a package of quail eggs in my fridge) then you know that they are notoriously difficult to peel. Making them in my Instant Pot helped a lot with peeling. It wasn’t as easy as with regular chicken eggs but so much better than if they were conventionally boiled. What made me a convert? I started proofing my dough in the Instant Pot! 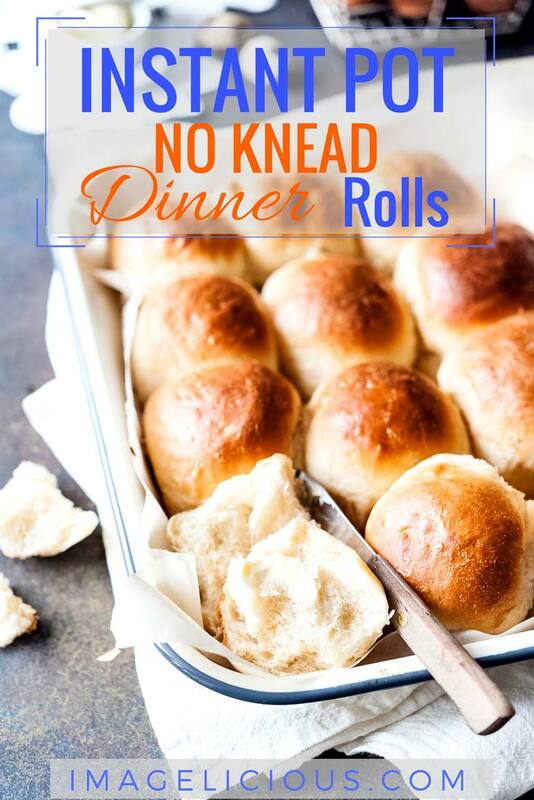 I use a Yogurt function of the Instant Pot to let the dough rise and make my Instant Pot No Knead Dinner Rolls! If it seems like some recipes cooked in Instant Pot aren’t actually faster than if they were cooked on the stove or in the oven, then why use Instant Pot? It actually is very convenient. 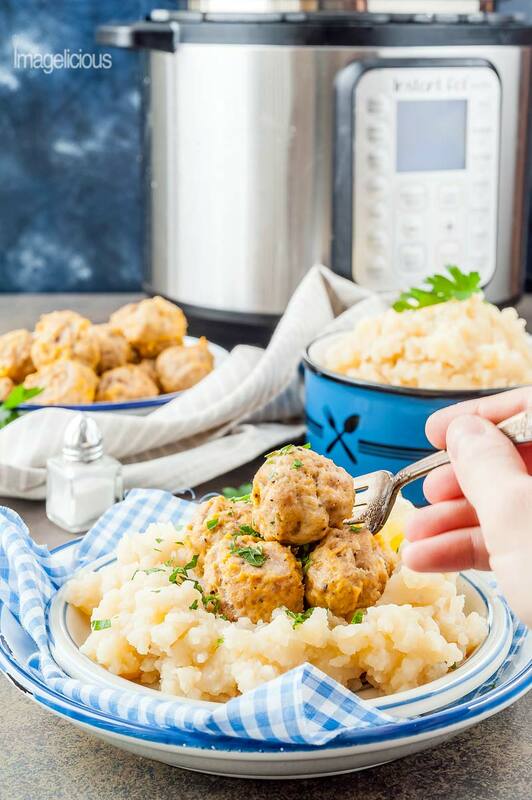 For example, my Instant Pot Meatballs and Mashed Potatoes are cooked in one pot at the same time. No need to bake the meatballs or pan-fry the meatballs. So easy, so convenient, and even healthier than a conventional method of cooking. And this is why Instant Pot has a big and loyal following – it’s easy, it’s convenient, even if it’s not instant. Just put all the ingredients in and forget about them – no need to babysit the food! Back to all the stews and braises, they usually take hours to slow-cook in the oven or on the stove-top. Making short ribs or lamb shanks isn’t a hands-on experience but it’s something for a lazy weekend and I often have to allocate 3-4 (sometimes even 5) hours to make them. Cooking the same recipes in an electric pressure cooker still takes time but that time is cut in half. I have my eye set on these Korean Beef Brisket Meal Prep Bowls to try. One of my favourite things about Instant Pot is the clear broth that you get when cooking beef or chicken. It’s golden and beautiful. If you add pasta to cook in the broth, it doesn’t come out murky or cloudy (like it would if pasta was cooked in a pot of soup on the stove); it still comes out clear. 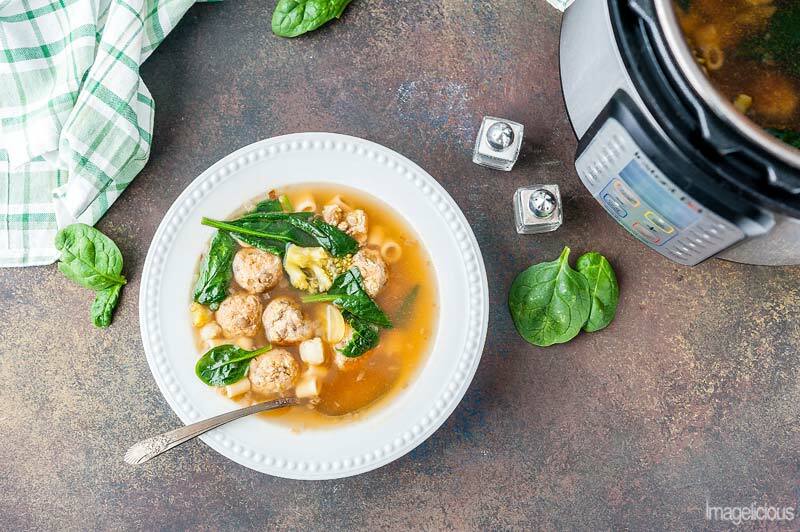 Just look at this Instant Pot Meatballs and Pasta Soup. This is my favourite vegetable broth base that I’ve been using for many years. So, here you have it: 7 Things You Need To Know About Instant Pot (and a bonus point). Would I recommend buying one? Absolutely! As long as you realize that it is not a magical appliance and don’t expect your life to change while using it. Do you love your Instant Pot? Were you disappointed at first with the actual cooking time? I’d love to hear from you! Comment below! Perfect article. My wife gave me an IP for Christmas last month, along with an IP cookbook. Even before my first use I couldn’t help but notice that the times listed in the cookbook for Total Time and Cook Time were two very different things. The time it takes for the pot to come up to pressure, and then to depressurize, exponentially increase the time it takes to cook everything. As you pointed out, this is something many people don’t know before they buy one. So far, most meats we’ve done in the IP turn out tougher and dryer than expected, despite following recipes to the letter (with natural release, etc). Chicken seems especially prone to terribleness in the IP, and it doesn’t save any time on it compared to an oven where I can constantly monitor it with an instant meat thermometer to remove them at precisely the right moment for ideal juiciness. Despite the downfalls, I’m liking the IP more and more and recently did a boneless beef short rib recipe where the ribs turned out perfect and moist; so that gives me hope and I plan to keep trying. Thank you for an accurate review of the IP, I’m sure it will help some people that don’t have one and are considering the purchase. If nothing else, it should help provide realistic expectations for them. Concerned about our our walls and cabinets. Should we be using it in the garage? Great post Julia! I finally ordered my Instant Pot, actually the Crock Pot version since it had a yogurt function and the IP base model didn’t. I think the first things I’ll make with it will be the boiled eggs (my daughter is crazy about them) and non-dairy yogurt. Is it weird that I’m most excited about the yogurt I can make with this thing haha 🙂 I was looking at Walmart today at the pressure cookers (they were out of stock of the Crock Pot ones), but they had a deluxe Pioneer Woman Instant pot with flowers on it. They’ve definitely gotten quite popular! Thanks, Sarah! I hope you enjoy your new electric pressure cooker! I don’t have experience with a CrockPot brand but I’m sure it’ll be very similar. And do please let me know if the non-dairy yogurt works. I still haven’t tried making my own yogurt! I bought an Instant Pot and it sat in the box for a couple of weeks until I got up the bravery to use it. I was, quite frankly, remembering my Mum’s pressure cooker from when I was a child and was scared of the hissing and the banging noises. So when I finally started to use it I was first disappointed that the cooking times were way out, but once I figured out that using it makes things very convenient for me I began to love it. I made soups and stews (it was winter, these were very welcome!) and after a while I thought let’s give the eggs a try. Now I always use the IP to boil eggs, it takes longer than on the hob, but the shells come off so much easier and I don’t have to watch the time. Yesterday I cooked potatoes in it (for the first time) to make mashed potatoes, I used the rice button, they came out perfectly. I don’t have a yogurt button on mine, so probably won’t be using it to make your dinner rolls, although I may use the recipe to make them without the IP. I was also terrified of my IP at first but it turned out to be not so scary. And just like you it took me a while to get over the disappointment of the Actual (!!!) cooking times. But now I love mine. I am going to try using a Rice button to cook potatoes also. Thanks for the suggestion!